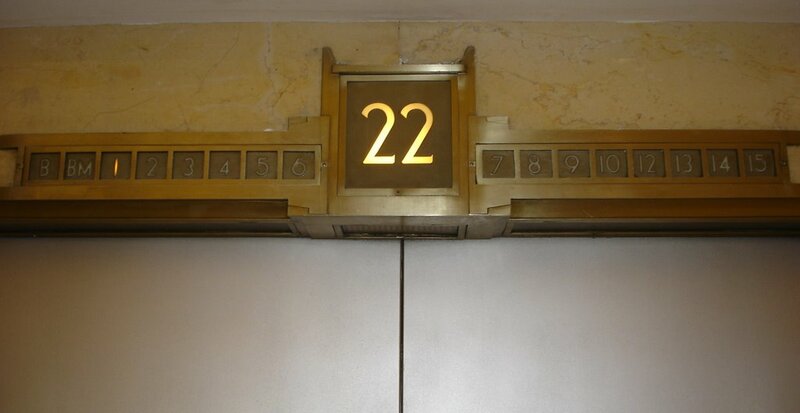 What should the new luxury hotel being built in the upper floors of the old Meier and Frank building be named? It is an interesting question. The name should imply a sense of history and place for a place with history -but not as a hotel. An article in the Oregonian from Wednesday, May 24th 2006 by Dylan Rivera, states that Sage Hospitality of Denver hired Portland’s Sockeye Creative to help with the naming process. The results were to be unveiled in mid-June. Over a month has passed without the announcement of a name. “We could probably do a lot of the homework and that type of thing ourselves, but we really feel it makes sense to work with somebody who lives in and is part of the fiber of Portland and Oregon.” -Brad Robinette, senior vice president of marketing for Sage Hospitality in the Oregonian. It is one of Portland’s iconic locations. Aaron Meier opened his general store on the corner of Front Street and Yamhill in 1857. In 1872 he took on Emil and Sigmund Frank as partners to form Meier & Frank. 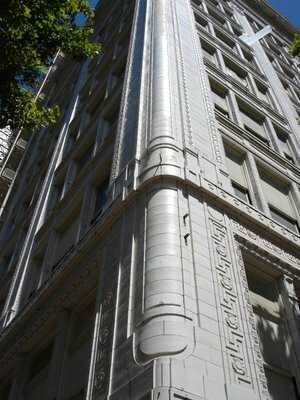 The store moved to Fifth and Morrison in 1898, taking with it Portland’s retail core. The present terra-cotta sheathed edifice was built in three segments in 1909, 1915 and 1932. When complete, it covered the entire block between 5th and 6th, Morrison and Alder. Today it is a stately reminder of past grandeur, but the white terra-cotta face of the building was chosen for its modern appearance. For decades, Meier and Frank stood at the social epicenter of downtown Portland where everything from clothing to books, pharmaceuticals and pets could be purchased. Clark Gable sold ties there in 1922 before going on to bigger and better things. People would rendezvous “under the clock” on the main floor. They would meet for lunch in the Georgian Room. At Christmas they took their children to Santaland (with a monorail!) on the tenth floor. The building's upper levels served as corporate headquarters for a chain of department stores that would eventually expand to include locations in Oregon, Washington and Utah. Meier and Frank was acquired by May Company in 1966. It was operated as an independent division, headquartered in Portland until 2002. Current operator Macy’s Northwest has dropped the Meier and Frank name rebuilding and re-branding the department store as Macy’s at Meier and Frank Square. As part of the redevelopment plan, a new luxury hotel and restaurant is slated to be built in the upper floors. 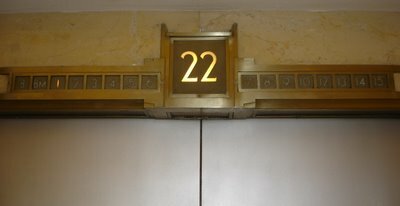 The name of the hotel should imply place, history and style befitting the hotels setting. Under Sage Hospitality’s Luxury Collection brand, the name will likely be along the lines of The _____, A Luxury Collection Hotel. 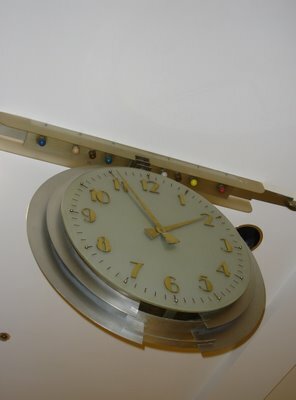 The most site-specific name, Meier and Frank is too derivative of the buildings history as a department store. The Frank, however has a certain muscular panache. The Pioneer speaks to the hotels proximity to Pioneer Courthouse and Square though perhaps it is a tad rustic. The Georgian honors the storied Meier and Frank restaurant. After the transit mall is rebuilt, the hotel will have access to the Max light rail system on three sides. Thus, The Max, (spiced with just a hint of Weimar decadence). Reaching far back, the building sits on a part of William Overton’s original claim, co-owned with Asa Lovejoy on the future site of downtown Portland. The Overton has the stylish sound of a classic hotel. For that matter so does The Lovejoy, (could a place for romantic getaways have a better name?) Portland’s other early proprietors; Pettygrove, Chapman, Stark and especially Coffin are not as well suited, but The Lownsdale has potential. 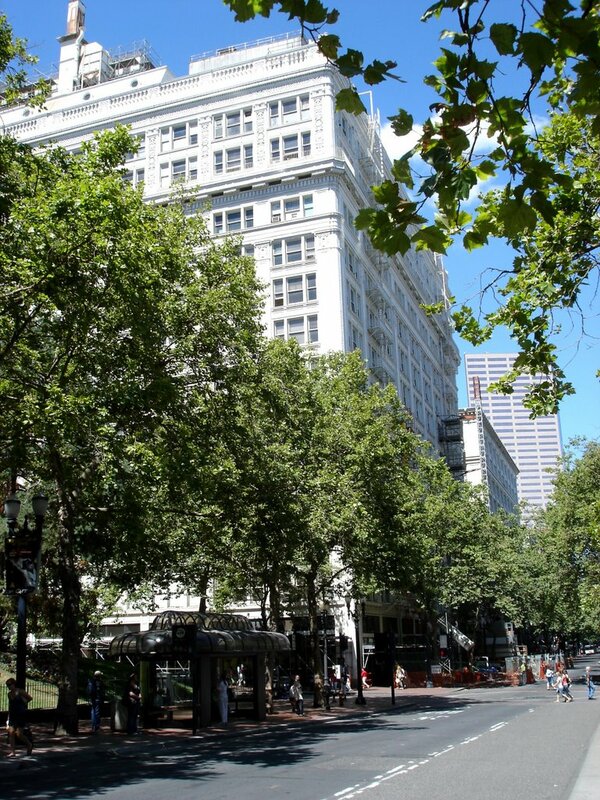 The Marquam Grand is an excellent appellation for a high end hotel and returns a historic name to downtown Portland. Eight names, vetted for place, history and style, offered pro bono! The building to the immediate right is the first Meier & Frank store at 5th and Morrision. To the far left can be seen the Hotel Portland, torn down by Meier & Frank in 1951 to make way for a parking lot (the site of today's Pioneer Courthouse Square). The tall red brick building to the right is the Marquam Grand Theater nee Opera House. 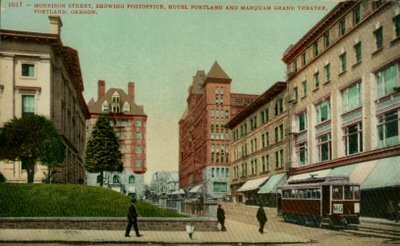 The Portland Symphony (later Oregon Symphony) had its first performance there in 1896. 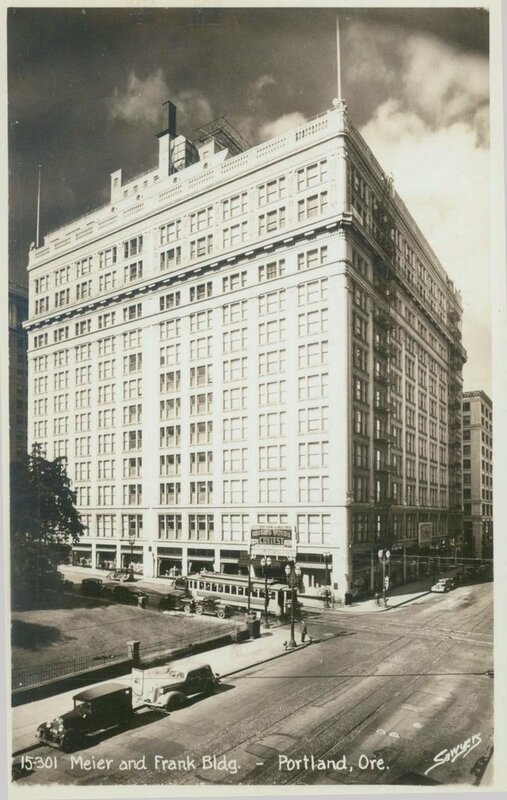 Then, as now, the Pioneer Courthouse (formerlly Post Office) is across the street from Meier & Frank, the corner of its lawn is in both pictures (as well as the black and white postcard at the begining of this post). I'm partial to "The Coffin"! Hee hee hee! It could be Portland's only Goth-themed hotel! Lots of velvet curtains and a candleabra in every room! A business idea comes to mind. A serious metal bar/hang out that isn't a venue. A serious goth bar/hang out that isnt' a venue. From this outsider's perspective, it seems like you should just hang out at Rotturé (315 SE Third) when shows aren't happening and ham it up with your gothiness. 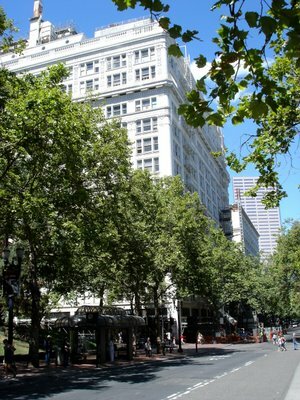 Just discovered this great blog, so probably they've already named the place - but I sure hope it isn't "Pioneer" - we already have Pioneer Courthouse Square, the Pioneer Courthouse, and Pioneer Place. That's about 2 too many "Pioneers", in my opinion. I will still throw in my vote for The Georgian (that was quite a place up there) or The Overton (it just sounds nice). Sadly, at this point we know the hotel to be The Nines. Which I would not vote for. An old building this classic should have a name befitting its history. The Nines brings to mind a freshly refurbished motel. Personally, I don't see a connection between Metal and Goth. Looking for the best deals can be a frustrating process if you do not know how and where to look, as there is a large amount of information about hotels promo codes deals online and offline to sort and process. I shall thus help to make your search for the best hotel deals a more systematic one by offering the following tips and advice.